Ethan is a mild-mannered guy just minding his own business - until one day his father is murdered by a gang of baddies and his gold is stolen. Ethan ends up meeting a man named Master T, a coffin maker and undertaker, who agrees to take him under his wing as an apprentice. He then trains him in the ways of Martial Arts so he can get revenge on his father’s killers. But he does this in a pretty unorthodox way - by using the resources at his disposal such as long hikes carrying coffins, digging graves, and fighting zombies to improve his Kung-Fu skills. On the other side of the patchwork, a group of White guys in absurd outfits and headbands are going after a cruel land-grabber named Titus and his backer named Mason. Thankfully there’s a hero named Duncan (Kirby) who has stellar fighting abilities. Will any of this fit together and make any sense whatsoever? Find out today! Here we have another Godfrey Ho patchwork concoction. You really can’t judge his movies by the same standard you judge other movies. They come from a singular and incredibly wacky world of their own. Keeping this in mind, despite what some wags on the internet think, we tend to like Mr. Ho’s oeuvre - but it’s not for everyone because you have to have a high tolerance for insanity and nonsensicality. If you take your logical hat off for about 90 minutes or so, there is enjoyment to be had. For instance, while there are some standard chop-socky elements at work here, at least every 10 minutes or so, something weird, wild and wacky happens. Whether it comes from the funny dubbing, nutty sound effects, the toothy Master T and his in-and-out Jay Leno impression, the sped-up footage, the intentional “humor” or the cadre of White guys in flashy ninja gear, there’s always something to keep your interest, no matter how incoherent the final product may be. 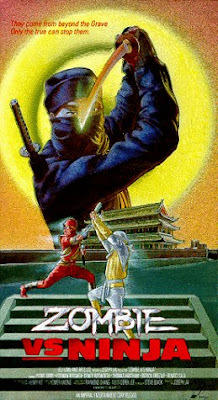 And sure, there are characters named Lin and Tiger, but how many movies have a ninja master named Ira? Or Duncan for that matter. And why do they all have mustaches and headbands proclaiming that they are “Ninja”s or in some cases simply just “Nin”? Since the movie went back and forth between the “White Ninjas” plot and the “Undertaker” plot, we much preferred the White Ninjas side of the quilt and it was always a bit disappointing when it went to the other side. And there’s some killer music to, in theory, tie it all together. 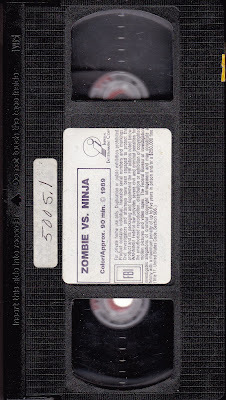 Seeing as movies like this must surely have limited appeal, we applaud Imperial Home Video for releasing this. But if they ever were going to take a gamble, surely it would be in the golden year of 1989. Video stores were booming, ninjas were booming, zombies were booming, everything was booming. All they had to do was sit back and let the demented mind of Godfrey Ho work its magic. All that being said, this epic probably isn’t worth the current $100.00 asking price on Amazon. Godfrey Ho fans: you know who you are. If you can find this movie cheap or rent it somehow, please do. Everyone else: this would be as good a place to start as any with the work of Mr. Ho, but confusion will certainly reign. In the end, movies like this, if nothing else, further cement the truth that the 80’s ruled. What would be your favorite Godfrey Ho film? Kev D.: Keep looking, you might get lucky at your local video store (like we did) or various tag sales, Goodwills, flea markets, etc. Avoid price gougers on the 'net. Venom: Good question, he has made so many gems over the years but our personal favorites have to be Clash Of The Ninjas, Kickboxer: The Fighter The Winner, and Undefeatable. Cool! Hopefully more people will watch it! It is silly fun. You see a title like this in Godfrey Ho's catalogue and your imagination runs riot (much like Godfrey's usually does) as to what it's actually like. Good to know that this one doesn't disappoint. Thanks for the review. You're welcome! Happy you enjoyed the review. Also you're right, so Godfrey titles do disappoint...thankfully this one doesn't...lots of weird and wacky moments.